Jeko Disain OU is an electronics design and manufacturing company that was founded in 2005. Electronic and mechanical equipment design and manufacturing. We offer solutions for optical quality control of liquid substances, determination of undesirable additives in liquids and their concentration measurement. Wide range UV light intensity measurement. Solutions for spectroscopy, production and renovation of devices. Solutions for test data collection and online (cloud) sharing between involved users. 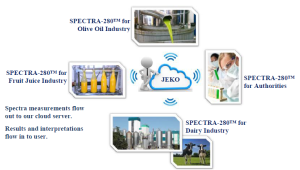 SPECTRA-280™ is a cloud-based food analytics platform, integrated with our accurate and low-cost flow-through liquid fluorescence sensor (spectrometer) and designed to help SMEs and large industries in the Dairy, Fruit Juice and Olive oil industries assess the safety and quality of their food products by replacing expensive and time consuming laboratory spectrometers. Improving food safety and quality leads to significant waste, water and energy reductions and improved resource efficiency.